EARS THE PATHWAY TO HEALTH? The benefits of treating the body via the ears can be quite surprising. We do not often think of them as means of maintaining health, but as you will see the following can be helped due to the energetic points found on the ear that relate to different parts of the body and also are a trigger to release emotional problems as well. 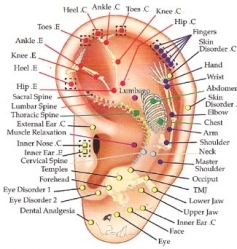 The following list, though not extensive is a good example of the benefits of combining auricular reflexology, auricular vitaflex techniques, ear candling and Young Living pure essential oils. The ears have been long seen as antennae for gathering energy in Chinese medicine. If you are feeling fatigued, often pulling on the rim of the ears away from the head will help to refresh you. 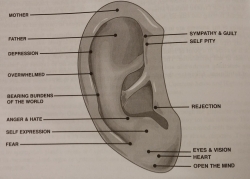 In Oriental Medicine the ears are also seen as having points which can be used to trigger various organs, systems and also treat emotional problems. You have probably heard of people using acupuncture to help overcome addictions, but there are also many other points on the ears. Some people have even reported improved sight when having their ears pierced as the lobe represents the head and the eye reflex can be found there. For years many ancient people have used candles to remove physical detritus from the ear canal such as wax as well as warming and aiding circulation and opening the canals and eustachian tube which connects via the throat to the ear and carries infection between the two organs. The throat also contains the tonsils and adenoids which are our first line of defence between our environment and the internal body, so these can also be helped as well as all the other lymph nodes found around the ear such as the mastoid gland. The salivary glands also can be helped. 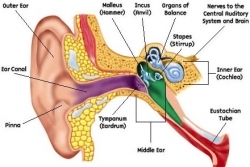 The ear also controls our balance via the labyrinth of canals that are found within it. Candling has also be found to help this and encourage any excess of tension, energy and fluids to balance. By releasing tension in the ear the neck muscles can also release and as everything is connected the shoulders and muscles of the scalp can also release helping headaches and stiffness. Any tightness will always act as a barrier and cause build up of wax, fluid and tension leading to problems in this small orifice and the narrow tubes around it. Ear candles are infused with herbs and essential oils to aid the healing properties of heat. Auricular Vitaflex Technique employs the fingers to be placed in the ears to cause a vacuum so that when they are manipulated in various directions the ear is able to rebalance via the nerves, tubes and muscles and cilia found in them. Young Living Pure Therapeutic Grade Essential Oils can also be used to aid the dislodging of any wax and energy blocks within the area. Young Living oils can also be placed on the emotional trigger points of the ears to help release stored trauma in the body's energy systems (meridians and nadas/chakras). When treating a client I will always take a full consultation and then tailor the appropriate treatments to suit their unique needs. This is because we are all different and have various life experiences and reactions that are special to us as individuals. I have had success with children's ear problems as well as adults in all the problems mentioned. One child who had had continues ear infections and operations was able to discharge a lot of unpleasant matter and did not have any more recurrences. Diet can also be a problem as many common foods cause a build up of mucus in the body and consequently cause blockages and infections, so this also will be looked at if appropriate during an auricular health session. If you wish to experience just a pure relaxation through the ears or would like to work to aid the body's natural healing using these natural approaches which do not contain any toxic chemicals and work with nature. 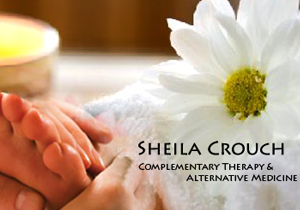 Please contact me at www.sheilacrouch.com to discuss how I could help you.